Source: kavkazr.com. All rights reserved.Earlier this summer, the capital of Chechnya witnessed an attack on a Russian Orthodox Church. Young gunmen entered the Grozny’s Archangel Michael Church, killing two military personnel and one worshipper while also injuring another. Many theories have emerged as to what happened. Chechen leader Ramzan Kadyrov, for his part, is convinced that these “rootless scumbags” acted on “instructions issued by one of the western countries”. Many local residents, meanwhile, believe that the attack was carried out in accordance with a security services “directive”, with the attackers’ corpses planted at the scene. So-called Islamic State entered the fray as well, immediately claiming responsibility for the atrocity. But while the Chechen authorities now wish to build a new Orthodox Church in Grozny, no one wants to give serious consideration to another version of events: that the murders were motivated by religious and national hatred. On 19 May, four young men, armed with firearms and bladed weapons, entered the church grounds while the evening service was underway. There were around 15 people in the church and four military personnel on duty around the grounds. The wife and children of church rector Father Sergiy were also in attendance. The attackers neutralised two of the military personnel on duty at the church entrance, removing their weapons. The attack was repelled by the other two military personnel following an exchange of gunfire that continued for around 20 minutes. The four attackers – twin brothers Ali and Amir Yunusov, 19, Mikail Elisultanov, also 19, and Ahmet Tsechoev, 18 – were killed during the shootout. So too were Russian military personnel Kairat Rakhmetov and Vladimir Gorskov. 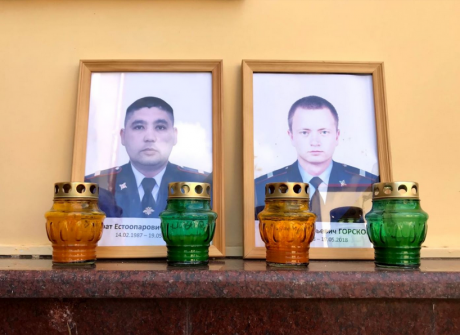 Images of Russian military personnel Kairat Rakhmetov and Vladimir Gorskov, who were killed in the attack, at the main entrance to the church in Grozny. Source: kavkazr.com. All rights reserved. The attack also claimed the life of one worshipper. Artyom Vshikov, who entered the church grounds a couple of minutes before the attack commenced, died of gunshot and stab wounds. The attackers also managed to injure Vshikov’s fellow worshipper Fyodor Napolnikov, a paediatric surgeon. Napolnikov and Father Sergiy kept the church door closed and prevented the attackers from getting inside. But they couldn’t prevent bullets from penetrating the walls, one wounding Napolnikov, the others damaging icons and furnishings. The other worshippers – mostly elderly women – suffered no injuries but were traumatised psychologically, none more so than Galina, Father Sergiy’s wife: on hearing the gunshots, she dashed to the rescue of her children and found herself in the attackers’ sights. She managed to hide from the bullets in the basement of the church refectory. Despite the fact that the attack was referred to as a terrorist attack in the press, legal proceedings were initiated only under the following two articles of the Russian Criminal Code: Article 317 (encroachment on the lives of law enforcement officers) and paragraph two of Article 105 (the murder of two or more persons). The Archangel Michael Church in Grozny is surrounded by a high unbroken fence. The entrance to the grounds looks out onto a flower park opened in honour of Chechen Women’s Day. The city centre boasts few spots suitable for a stroll – there’s Putin Avenue, there’s the square near the central mosque, and there’s the just-mentioned flower park, which teems with people (mothers with kids, school children, young people) throughout the day. Chechens tend to stroll in groups – young men often walk the streets in threes or fours. So a group of inconspicuously dressed guys carrying a guitar case wouldn’t have aroused anyone’s suspicions. It is understood that the attackers drove most of the way to the church in a taxi, emerging from the vehicle either at the intersection or slightly further down the road, and proceeded on foot through the flower park. The park would have been less busy than usual that lunchtime: the holy month of Ramadan had just begun and many people don’t leave their homes till evening. Source: kavkazr.com. All rights reserved.The church is a stone’s throw away from the park, with a single pedestrian crossing en route. Planters with palm trees – a big hit among tourists – line both sides of the road. A two-minute walk brings you to the church grounds entrance, where you’re greeted by two green sculptures – one of a great she-bear, the other of a little bear cub. Sculptures of this ilk have recently been springing up in Moscow, and the trend quickly spread to Grozny. The bears, too, have proved popular among the city’s tourists. Chechen police officers now keep watch by the entrance while others shelter from the heat in civilian cars parked nearby. Six seconded military personnel patrol the grounds, weapons at the ready. Prior to the attack, two military men usually stood outside the gate, with several others scattered throughout the grounds. They’re used to the fact that the main guests here are tourists and worshippers: older Russian women, military personnel from Khankala air base and gypsies. Locals occasionally drop by the gate as well. On a couple of occasions under Father Sergiy they entered the church itself to find out for themselves whether the interior is covered in gold. On entering the grounds, you see the large wooden door to the church immediately in front of you. Usually this door is closed: the main entrance is on your left, just around the corner. It’s through this entrance that worshippers and tourists enter the building. The door, kept closed by Father Sergiy and paediatric surgeon Fyodor Napolnikov, saved worshippers’ lives on 19 May. Going left round the church, you’ll see a small utility room in front of you. There, behind several plastic brown doors, assorted scrap materials are stored. There’s also a toilet with a washbasin and a small room for security staff. Adjoining this structure is the site where the seconded military personnel are housed. Two of them died on 19 May, while two others miraculously survived. Before the main entrance to the church is a small courtyard. Pheasants once lived here, and it remains home to several chickens, cats, rabbits and a dog. Sergiy and Galina’s kids often frolic here. Sergiy and Galina recently had their third child – he’s still very young and hasn’t learned to sit up on his own yet. 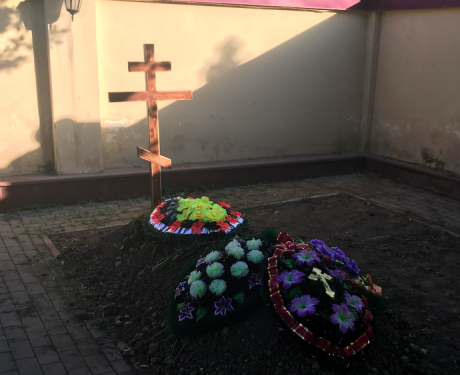 The grave of the parishioner Artyom Vshikov, who died in the attack. Source: kavkazr.com. All rights reserved.To the left of the main entrance is the refectory, its glassed section seriously damaged by bullets. Below is a basement where Galina hid from the attackers. The worshipper Artyom Vshikov could also have taken refuge there – but he dashed in the opposite direction and attempted to conceal himself between an unfinished building (abandoned after the departure of the previous priest) and the house where the church staff live. It was there that he met his end. Now he is buried to the right of the refectory. The grave was dug in the garden, just behind a sprawling fruit tree. The church is absolutely riddled with bullet holes. Icons have been damaged, windows broken, the holy water tank ruptured. One bullet hit the church shop. 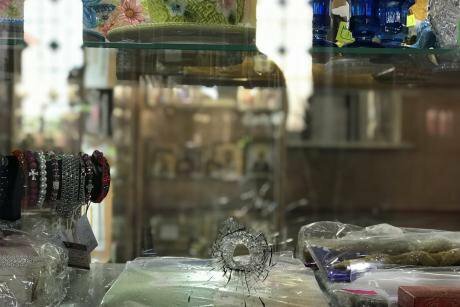 Georgy Petrovich, who was manning the shop at the time, thankfully escaped unharmed: he was laying the wounded Fyodor Napolnikov on the ground when the bullet struck. Some of the damage has already been covered up with whitewash. Chechnya’s human rights ombudsman Nurdi Nukhazhiyev dubbed the attack on the Michael Archangel church “blasphemous, treacherous and unprecedented”. Nukhazhiyev also stressed the importance of the work of the security services, who, he claimed, arrived at the church in good time. Some of the ombudsman’s arguments are highly debatable. This attack on an Orthodox church is by no means unprecedented for the North Caucasus: only a few months ago, in mid-February, 22-year-old Khalil Khalilov shot dead five worshippers – all of them women – in the Church of Saint George the Victorious in Kizlyar, Dagestan. Kadyrov has his own version of events: in the immediate aftermath of the attack, he asserted that the militants had “received an order from one of the western countries”. Kadyrov also claims that the security services were in possession of intelligence regarding an impending attack on an important protected site. The veracity of these assertions is difficult to ascertain. But if this is indeed the case, it ought to be asked why security in and around the church was not increased. After the Kizlyar attack, unknown individuals spread rumours that the next atrocity would take place in Grozny, potentially at Easter. On the night of 8-9 April, the Archangel Michael Church held its Easter service – the congregation, as always, was vast. Not everyone can make it out to church at night, however, so the church arranged a daytime service as well, the latter even better attended than the former. The day dawned sunny and warm. The table in the churchyard was absolutely heaped with kulichi (Orthodox Easter breads) and eggs, so much so that late arrivals had to put their baskets full of traditional festive dishes on the ground instead. Father Sergiy was in a genial mood and even gave people the chance to go up to the top of the bell tower and ring the bells. Security was high indeed: the approach to the church was completely blocked off, with an initial cordon set up directly on Kadyrov Avenue. Bags and pockets were systematically searched. A second security check, no less thorough than first, was performed at the entrance to the church grounds. The day passed without a single incident. If someone puts their minds to guarding a building in Chechnya, not even a fly will get in. On 19 May, however, a semblance of this level of protection was created only ex post facto. “Special groups of law enforcers,” who, according to Nukhazhiyev, “prevented the armed men from entering the building,” arrived on the scene when the surviving security staff had already done their job and eliminated the assailants. To document yet another “successful” special operation, the siloviki had to block off all nearby streets for several hours. Civilians were not allowed through the cordon under any pretext, and anyone caught taking pictures had their phones seized, whereupon any photographs were promptly deleted. The result was a perfectly watchable movie made in the spirit of Indian action films. Leading man Ramzan Kadyrov takes charge of a special operation to rescue the believers. Under his sensitive guidance, military men surround the church and force their way in to rescue women and children. It’s not for nothing that the first film the young Ramzan Kadyrov ever saw at the cinema was an Indian one. “They just couldn’t decide what door to open for them. Eventually they opened the one that’s always locked,” says Georgy Petrovich. Fully outfitted military men were screaming “Hands up!” despite the fact that there was no one in the church but the worshippers. Because the streets were all blocked off, it was a long time before the heavy bleeding Fyodor Napolnikov could be taken away. “‘He’s dying here!’ I tell them. ‘Can’t go outside yet,’ they reply. It was God who saved him,” says Georgy Petrovich. Chechen officials of all stripes like to declare that the republic has long fostered peace and mutual understanding between representatives of all nationalities and religions. The national and religious composition of Chechnya is currently rather homogeneous. In 2010, the republic’s population was over 95% ethnically Chechen, with 17 nationalities making up the remainder (ethnic Russians comprise under two percent). Things were very different back in 1989, when over 25% of the population was Russian. The older generation remembers Grozny as a multinational city home to large numbers of Russians, Armenians and Jews. But they began leaving in droves in the early nineties – an outflow of people triggered by the mass ethnic cleansing practiced under President Dudayev. Chechnya’s Russian-speaking population even sent President Yeltsin a letter about the pogroms and ethnically motivated attacks going on in the region. The facts of the unfolding inter-ethnic conflicts were also documented by human rights activists from the Memorial human rights association. There are currently almost no indigenous Russians living in Chechnya today. Though you might encounter a few Russians on the streets of Grozny, these are most likely to be visiting tourists or seconded military personnel stationed with their families at the military base in Khankala. The so-called Russian stanitsas (villages) of Chechnya – Naurskaya, Chervlenaya, Shelkovskaya, Assinovskaya – are populated mainly by Chechens. A total of eight churches and two chapels are registered in Chechnya. Their congregations consist of military personnel and a few Russian oldsters who had nowhere to hide from war and ethnic cleansing. Irina Vasilievna (name changed) and I say our hellos in Chechen. Irina came to Grozny as a young woman. She worked at a factory not far from her house, close to the bus station. She had a husband and two sons. All three died. Irina Vasilievna nearly perished herself on several occasions. One time a bomb fell in the immediate vicinity of her house, bursting a major gas pipe. Miraculously enough, there was no fire. She spent some time in a village where she was taken by a Chechen neighbour. A young Russian soldier holed up in her house for several months: some Chechens found him hiding in the forest and delivered him into the “safekeeping” of the only Russian woman they knew. Several times a year, Irina Vasilievna and a small group of Russians head to the graveyard near the old cannery. More Russians can be encountered here than anywhere else: a large swathe of land very much akin to a forest accommodates some 300 Christian graves. Source: Ekaterina Neroznikova. The group tidies up the graves of relatives and acquaintances. Their efforts, though, are a drop in the ocean. The cemetery is in a terrible state: tombstones wrecked by vandals, fences dismantled for scrap metal, wooden crosses rotting and metal ones rusting away. Visible traces of the war remain, too: surviving monuments are riddled with bullet holes and some graves are still torn up by bombs. The cemetery once served as a dividing line between the militants and the Russian military. Now it’s a quiet place: ivy curls around the trees, birds tweet somewhere. The bomb craters are overgrown with weeds and filled with garbage (how it got here is anyone’s guess). There’s almost never anyone around. 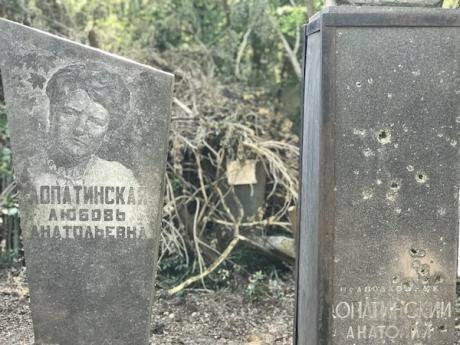 “Well, where else would we Russians meet if not here?” Irina Vasilievna laughs when we come across her and several other Russian women on the way back from the cemetery. The women had been clearing up, and now they were walking together to the bus stop. Having recently celebrated Easter, they were discussing how this year’s service had gone. The militants’ attack on the church was still a month and a half off. 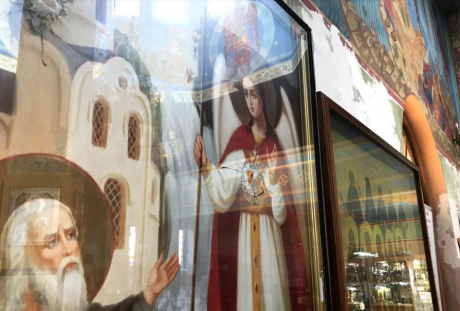 “What’s really scary is not so much that they’ve already attacked us as the fact that they might come back,” says Georgy Petrovich from the church shop. The Archangel Michael Church of Michael, the principal gathering spot for Grozny’s Russians, is becoming more and more like a fortified stronghold.